For many carboholics, a big ole pile of fluffy, creamy mashed potatoes is like a big, warm hug. It’s an iconic comfort food, and can bring back fond memories of family holiday dinners. Or, if your mom had a tendency to make them lumpy, maybe not so fond. I can tell you that I personally LOVE a big ole pile of fluffy, creamy mashed potatoes with a pat of butter slowly melting on top. Gravy, I can take it or leave it, but I LOVE mashed potatoes. So when your diet plan says NO POTATOES FOR YOU that feels like a punch in the gut, right? What’s wrong with potatoes, anyway? 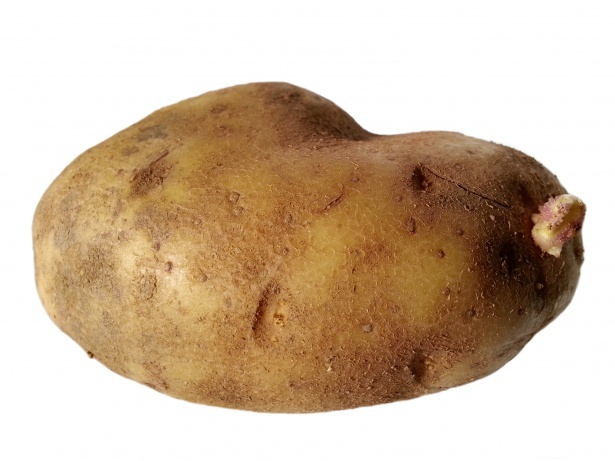 While potatoes are high in potassium, have magnesium and vitamin C, they are also very high in carbs. For some of us, that means spiked blood sugar and added weight. I envy those who can eat potatoes because I am one who must watch my carb intake like a mama bear watches her cubs. 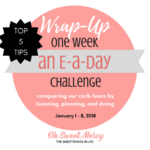 The Trim Healthy Mama Plan has taught me that consuming high carb and high fat foods together wreaks havoc on your body in the form of increased insulin response. So I’ve learned I can have my healthy fats like grassfed butter and coconut oil, but need to keep my carbs low. The ingredients alone…might be pure and natural, but there is nothing very natural about high blood sugar and an exploding waistline. Some people can eat potatoes and not have a problem. If that’s you, enjoy those yummy spuds! If that’s NOT you, I have a surprising solution for you. No, cauliflower is not exactly the same as potatoes. Your tastebuds might complain at first, but your blood sugar and waistline will rejoice. One cup of cooked cauliflower has only FOUR net grams of carbs, while the same amount of cooked, white potatoes has THIRTY. All the potassium and magnesium and vitamin C in potatoes won’t reduce the impact of that glycemic load, trust me. When properly prepared, cauliflower fauxtatoes are surprisingly like mashed potatoes. Some people say they can’t tell the difference. I think those people probably have less sensitive tastebuds. I can taste cauliflower but it’s not an overpowering cauliflower flavor to me. And the trade off with a glycemic index that won’t spike my blood sugar is worth it. If you abhor cauliflower, I can’t guarantee you’ll like this recipe. But try it anyway – I’ve included a single serving recipe so you don’t have to make a lot to try it and see. So how do you make fluffy, creamy fauxtatoes anyway? I have two tricks to share with you. First, it’s essential that your cooked cauliflower be as dry as possible. So don’t boil it. Steaming is better BUT still imparts moisture. 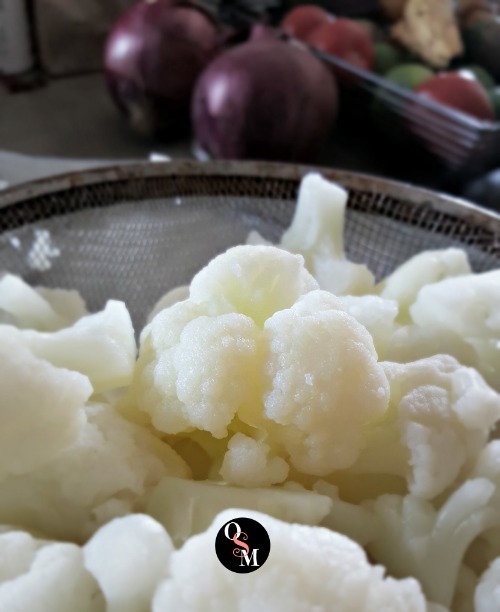 If you steam your cauliflower, spread it out on a baking sheet and let it sit for a bit for some of the water to evaporate from it before proceeding. But, I’ve got TWO better ways. If you don’t have a microwave, bake your cauliflower in the oven. A bag of frozen cauliflower will bake in a 350 degree oven in about 30 minutes. Fresh cauliflower will work as well. A potato masher won’t cut it here, folks. Potatoes and cauliflower are just different in their intact, solid forms so it takes a different approach to turn this healthy, cruciferous veggie into creamy, fluffy fauxtatoes. If you have a food processor, they are an excellent tool. If you’re like me and don’t own one, I hope you have a stick blender. If you have one like mine, you’re all set because that extra attachment is part of my second trick. Use your stick blender or food processor to break down the cooked cauliflower as much as possible. I’ve got this bad boy on my Amazon wish list! Add your other ingredients such as butter and cream and salt with the cauliflower. BUT one note on high-powered blenders…they make baby food mashed fauxtatoes. I discovered this while making the dairy free version! Ooops. Once everything is all blended, it’s time for my second trick…plus a bonus secret ingredient. The Trim Healthy Mama Online Store has so many wonderful, healthy products to support your journey to good health and a slimmer waist. And one I love right now is their Simply Sunflower Lecithin. It has joined my list of ingredients to PUT IN ALL THE THINGS! Soy lecithin can be found in just about everything, but it’s not healthy. Simply Sunflower lecithin on the other hand, is – it’s a nonGMO brain food that supports and nourishes your nervous system. Lecithin also has this amazing super power! Lecithin is also an emulsifier so it makes ALL THE THINGS SUPER CREAMY. You only need a small amount, too. I add it to my coffee every morning and to soups, sauces and more. The other day, I decided to add it to my mashed fauxtatoes and discovered this simple trick to make them simply amazing. 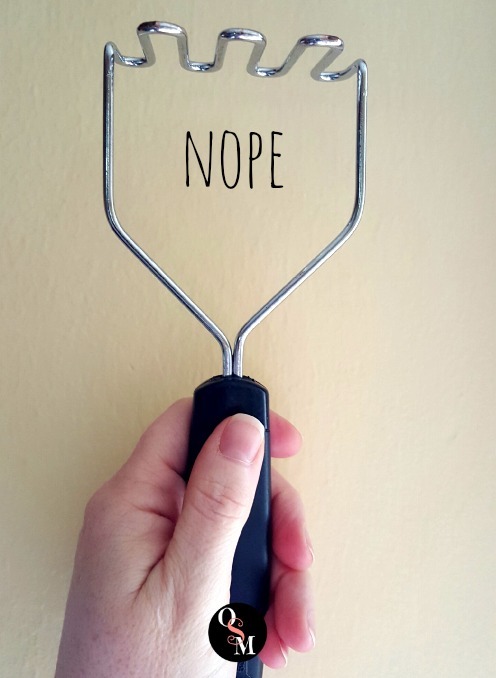 Since I had thought to add my lecithin AFTER I’d already pureed my cauliflower, I accidentally discovered my second trick – using the whisk attachment on my stick blender. The result? Fluffy, creamy mashed fauxtatoes. I made it again the same way next day and BAM – fluffy, creamy mashed fauxtatoes. I was sold. Looks like a carbfest, doesn’t it? This delicious meal had almost none! A delicious THM S style meal that will leave you satisfied without busting your blood sugar levels. What if I don’t have lecithin? I used cashew milk, which while creamier than almond milk, is not creamy like heavy whipping cream. If you don’t have lecithin, try using some heavy whipping cream but make sure to use a whisk attachment to fluff up those fauxtatoes! Using a hand mixer may also work – one more benefit cauliflower has over potatoes…since they are nonstarchy, they won’t get gummy if you overwork them! I’ve used a hand mixer to whip potatoes before and made glue. Blech. What if I can’t have dairy? I made these dairy free by leaving out the butter and adding a touch of butter flavoring. I honestly thought they were better without it, and if you don’t like artificial flavorings by all means leave it out. The lecithin doesn’t have much flavor but it does make these fauxtatoes delicious in spite of the lack of dairy products. If you are dairy free, you will want to make these with lecithin, because you get the creaminess that dairy products provide without the upsetting qualities of dairy. Trim Healthy Mamas, here’s how these delicious fauxtatoes fit into your healthy eating plan. Lecithin does have fat, so we do need to be mindful when using it in E or FP settings. One teaspoon of lecithin has 1.5 grams of fat. For E or FP settings, make the Dairy Free Option. This will mean the Single Serving recipe has about 1 gram of fat. The Multiple Servings recipe will have about 2.5 grams of fat. For S settings, we don’t count the fat grams, isn’t that wonderful? 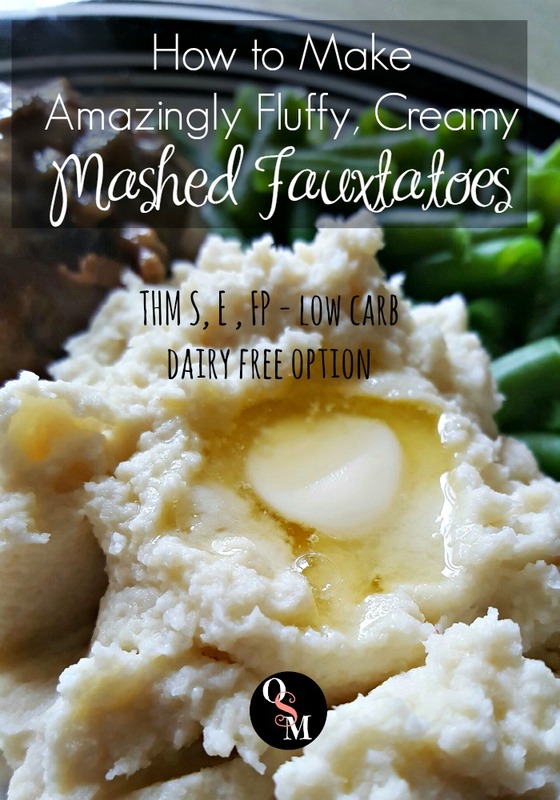 …but don’t want all those carbs spiking your blood sugar, make these amazingly fluffy, creamy mashed fauxtatoes instead. Your body will thank you! Craving mashed potatoes? Body says NO CARBS FOR YOU!? Make these delicious, fluffy and creamy Mashed Fauxtatoes instead. THM friendly with a dairy free option, too. Make as above EXCEPT eliminate butter or heavy cream and be sure to use lecithin. Butter flavor can be added if desired. I tried 1/4 tsp for the Multiple Servings version. Use the whisk attachment on your stick blender and whisk the lecithin in until completely incorporated and fauxtatoes are nice and fluffy. Or whisk by hand or try a hand mixer if your stick blender doesn't have a whisk attachment. Trim Healthy Mamas, here's how these delicious fauxtatoes fit into your healthy eating plan. For S settings, we don't count the fat grams, isn't that wonderful? 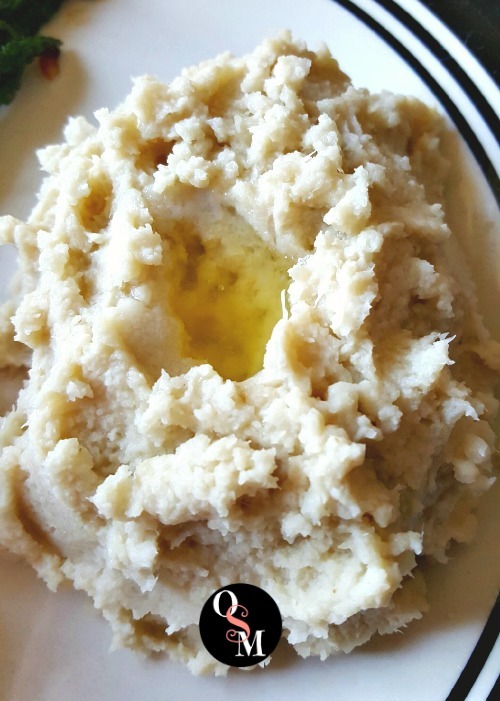 Like this Mashed Fauxtatoes recipe? 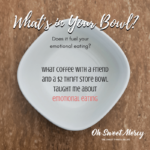 Please share with your friends and pin to your favorite Pinterest boards! To bake fresh cauliflower, would you need some liquid to keep it from “roasting”? I don’t use water and haven’t had trouble with it myself but I do keep a close eye on it. You can add some water if you’re concerned about that but then you’re not getting a dry cook. You’d need to let them steam off or squeeze between a towel to try and get as much moisture out as you can. I don’t have a stick blender but I have a kitchen aid blender–can I make it in that. I have a food processor–are you suggesting that you put it in the food processor if you have one and then transfer it to a bowl and use a whisk attatchment? Is there a simpler way of doing it all in the food processor–can the lecithin be added at that point? Thanks so much. I want to make this but I know if it has all these separate steps, I probably won’t make it. Maybe I’m overcomplicating? Those are great questions! I certainly don’t want to make things more complicated for anyone! I was just using the tools I had, and discovered that whisking really made a difference in fluffiness. I do not own a food processor, so I can not say for sure they would turn out as fluffy using that. You could certainly try it though! I envy your kitchen aid, truly! One day, I will have one. Since I’m not familiar with using them, I can’t really say. You want the cauliflower to be “mashed” like potatoes. You may be able to just use the whisk attachment on the kitchen aid for the whole thing. If you decide to try that I would love to hear how it turns out, and I know my readers would appreciate it too! As far as the lecithin, I don’t think it would hurt it at all to add it all together in your food processor (or kitchen aid, for that matter). Hope this helps! Thanks so much for stopping by! The meat in the picture looks AMAZING! Can you please tell us what that is?….I’m off to make to this recipe! So glad to hear someone talk about sunflower lecithin. I bought some and forgot what to do with it. Thanks so much! Hi Sharon! Thanks for the compliment. It’s been so long since I’ve written this post I had to think a minute lol. 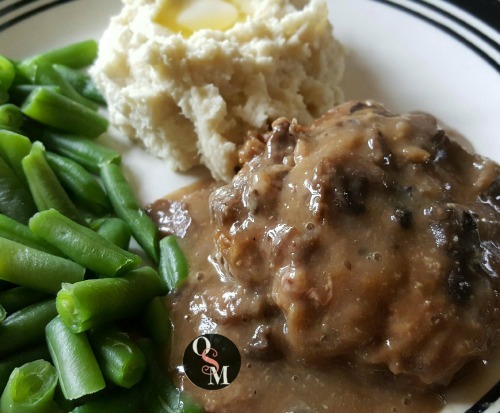 I’m pretty sure it was a low carb version of one of my hubby’s faves: Poor Man’s Steak. I remember thinking “I need to put that on the blog” but never did. Thanks for reminding me 😉 And, happy to help! Thanks for stopping by, and hope you enjoyed the mashed fauxtatoes.